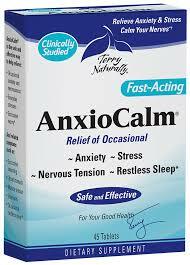 Anxiocalm boasts pure and natural ingredients and seems to be a great alternative for anti-anxiety medication for those that suffer from a mild case of the worries. Once taken, the calming effect seemed to take action in no time at all and the effects of this fast-acting formula compare to the relief of chamomile and melatonin. Taking Anxiocalm at night was especially helpful to feel a sense of well-being and relaxation while studying, assisted in late nights on deadline and helped with nervousness and difficulty falling and staying asleep.